Zara Phillips has been named 2006 BBC Sports Personality of the Year - 35 years after her mother, the Princess Royal, received the same honour. She won the public vote ahead of golfer Darren Clarke and gymnast Beth Tweddle. The award marked the climax to a thrilling year for Phillips, who holds both world and European equestrian titles on her horse, Toytown. "For two members of the same family to win the award for the first time is very special," Phillips said. "My mum said when she won it no-one else was in the running! In the build-up to it, I didn't think it would be a big thing for me. "I was thinking 'I'd rather have my world gold medal than the Sports Personality of The Year award'. "But when it actually came around to the night, and I was up there on the stage, it was unbelievable when you looked at all the top sporting people in the room." Phillips looked shocked and delighted as she collected her prize at a crowded NEC in Birmingham with one third of the public vote. "It's just amazing to be here among these people and to win this is absolutely amazing," she said. Clarke had been hot favourite to win the award after he helped Europe to victory over the United States in the Ryder Cup just weeks after the death of his wife Heather. But the 38-year-old from Northern Ireland had said beforehand that he did not want to triumph on a sympathy vote. The show was taking place outside London for the first time in the event's 53-year history, with 3,000 tickets snapped up by members of the public. "The atmosphere was brilliant and I was in awe of everyone," Phillips added later in an interview on BBC Radio Five Live. "There were so many fantastic people up for the award, I personally didn't expect to win. "It's great for my sport. The people that voted have obviously viewed what we did this year and seen what it's about. "Hopefully it'll encourage more people to come and get involved." Clarke, who won three matches out of three at the Ryder Cup, secured 21% of the vote, while world champion gymnast Tweddle earned 12%. Phillips won the individual gold in the three-day eventing competition at the World Equestrian Games in Aachen in Germany. The Queen's granddaughter produced a near faultless display over the three days of dressage, cross country and show jumping. She also helped Great Britain claim the team silver and has become only the third rider to hold the European and World titles at the same time. Phillips, whose partner is England rugby star Mike Tindall, won the world title in the aftermath of the death of her close friend Sherelle Duke at a horse trials in Brockenhurst a few days earlier. Her mother, the Princess Royal won the coveted BBC award in 1971. 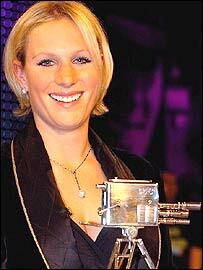 Zara Phillips - A worthy winner?